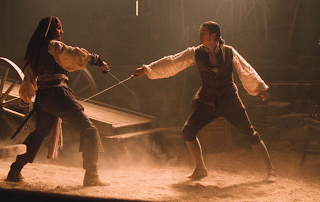 Snippets of Jack: "Let's Just Haul Out Our Swords"
"Let's Just Haul Out Our Swords"
Every Pirates of the Caribbean movie that has been made has always had some pretty epic battles and some great sword fights. Just about every character has proven that they sure do know how to use a sword. And whenever there is a dispute, that skill sure does come in handy? Which sword fight is your favorite? These are a few of mine. Hector Barbossa has had it out for Blackbeard ever since Blackbeard stole the Pearl, as well as his own leg, from him. Creatively, Barbossa dips his sword in poison, so the slightest contact with it can kill you. Barbossa meats Blackbeard again at the Fountain of Youth. Revenge is sweet. 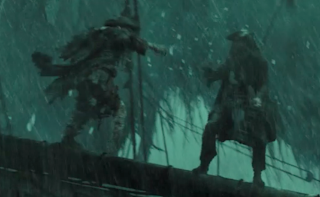 They duel, and ultimately Barbossa wins, stabbing Blackbeard with the poisonous sword. Amoung sword fighting, Barbossa also enjoys collecting rare, poisonous frogs. Barbossa: "Can't an old man have a hobby?" Something fishy is going down in England for Jack. Everywhere he goes, he hears talk that Captain Jack Sparrow is recruiting sailors, when really Jack is doing no such thing. 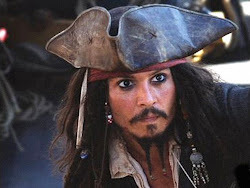 When he walks into a bar, someone even scoffs at him for dressing like Jack Sparrow. Finally having enough, Jack confronts this imposter. Jack: "You've stolen me and I'm hear to take meself back." Of course, the only way to do that is through a duel. When the imposter uses a special move, Jack realizes who it is: his long lost love, Angelica. They end their duel with a nice kiss. Jack: "I've always wanted to do that." Jack and Jones are fighting for the key and chest with the heart of Jones, and things don't look the best for Jack. They travel around the whole ship and the most epic part takes place as they duel on the mast in the pooring rain. Jack even falls off, clinging to the chest for his life. Jack gets the heart from the chest and considers stabbing it. But once Will is dying, Jack lets Will stab the heart and kill Davy Jones. "Calypso" -The last word of Davy Jones. After being abandoned on the same island twice by Barbossa, Jack finally makes it back to the Isla de Muerta, even more hungry for revenge. Jack, too clever for just about anyone, secretly steals a piece of the cursed aztec gold, making him imortal also. Jack: "I couldn't resist, mate." And they just continue to fight. Barbossa: "So what now, Jack Sparrow? Are we to be two immortals locked in an epic battle until judgement day until and the trumpets sound?" Jack: "Or you could surrender?" And they continue their battle until Will lifts the curse and Jack pulls out his gun and shoots Barbossa instead. This is one of the best scenes of the whole series. 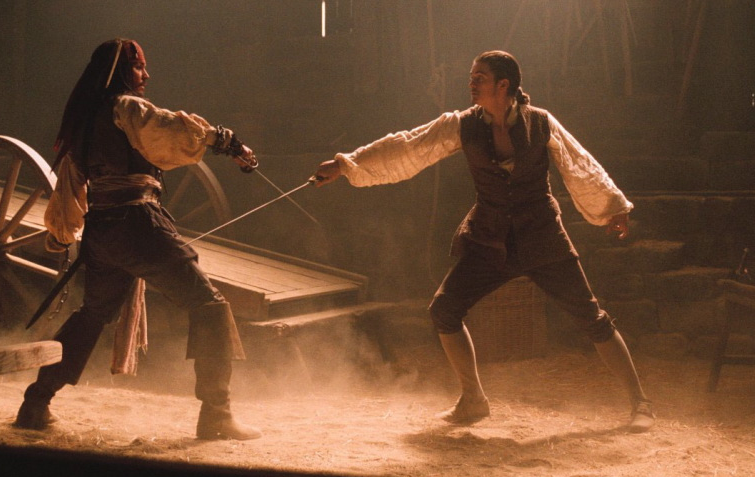 From the second Jack and Will first meet their both on eachother in a pretty heated duel. Will hates pirates and anyone who threatens Elizabeth. Jack just happens to be both. Will: "I practice three ours a day so that when I meet a pirate, I can kill him!" The two fight around the whole shop, Will determined to kill him and Jack trying to escape. Finally, Jack has Will cornered with a gun, but the blacksmith wakes up and knocks Jack out, just intime for the Royal Navy to arrest him. A three way battle takes place in the Isla de Cruces for the heart of Davy Jones, each wanting it for their own reasons. It's every man for themselves. Things heat up as the men are forced to roll around the island on a giant wheel. They've all got grudges on the other, claiming the other ruined their life. Norrington: "By your leave Mr. Turner." Will: "By your leave, Mr. Norrington." Then, Will has an epiphany: "I used to practice three hours a day so I could kill a pirate. Well, now I am one." The circle of life, William Turner. But it's more than just the key they are fighting for, it's also Elizabeth. Norrington still holds a grudge on Will for stealing her and Jack is still confused after their curiousity speech. All this anger sure does make for a great fight!